Jon English was an Australian music legend. However, as a child of the 80s and a teenager of the 90s, his astonishingly good repertoire of music eluded me as I was simply out of time to the era when he was one of the major stars on the Australian Music Scene. Yes, I'd see his appearances on television throughout the years, but it wasn't until his death in 2016 that I started to look at his legacy; the legacy of a rock legend if there ever was one. Wine Dark Sea is one of the most compelling album titles, for a debut release, that I've ever come across. Similarly appealing is the album artwork that immediately draws you in; artwork that is most certainly perfectly suited to the large canvas of the then dominant vinyl format. In fact, the entire album is a perfect time capsule of early 70s rock. While Wine Dark Sea and much of English's catalogue has remained out-of-print for years, streaming services like Apple Music ensure that these hidden gems remain relevant; provided the rights holders continue to licence the music. The Apple Music stream sounds very good with a considerable analogue tonality that harks back to the era but also presents a somewhat concealed presentation. That isn’t a criticism as I find digital music has the tendency to be a little too detailed, resulting in an albeit cleaner presentation but one that is also rather clinical whereas the analogue nature of the sound heard here is more organic and less perfect thereby resulting in what I consider to be a far more enjoyable sound to listen to. Of course, if you like digital clarity, then you may not be impressed by the streaming edition of Wine Dark Sea. I have compared it to the TIDAL Hi-Fi stream, but despite TIDAL Hi-Fi being CD-quality, the edition they have been given by the rights holder is the lossy version, essentially the same as Apple Music, hence there is no difference in the streams. That said, it sounds great and if I remove my audiophile mindset, thereby applying John Darko’s Music-First Audiophile mantra, this is more than good enough. Summer Song is a solid pop-rock tune to start the album with. I'd love to hear Jimmy Barnes cover this song as it would be perfect for his vocal style. The musicality is solid and thoroughly enjoyable with a mix that allows all musical elements to be present in the soundstage ensuring a decently presented dynamic range; a pleasure especially considering so many modern recordings are overly compressed. Sweet Lady Mary is a killer cover song, penned by Ronnie Lane, Rod Stewart, and Ronnie Wood of the Faces. As much as I enjoy the original, this rendition by English takes the song to another level and is, in my opinion, significantly better. Regardless, what I love about Sweet Lady Mary is how the origins of Rod Stewart's solo works can be heard here as well as the influence Ronnie Woods would later bring to The Rolling Stones. It really is an influential tune. 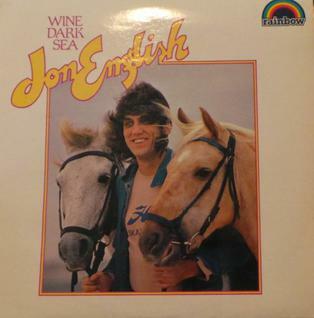 Wine Dark Sea is a beautiful Jon English, original, composition. I could listen to this song on repeat for days on end, it’s that good! Horsehair And Plastic is another original composition but isn't great. It’s pure filler and sounds completely out-of-place after Wine Dark Sea. Close Every Door is one of the greatest songs from the musical Joseph And The Amazing Technicolor Dreamcoat and this rendition from English is, without doubt, one of the very best ever recorded. English's gritty, yet smooth, vocal is perfectly suited to the song. Monopoly is a fun song that while different in styling to Close Every Door, doesn't nearly give the sudden shock, and out-of-place feel, that occurred with Horsehair And Plastic. Great rhythm! Handbags And Gladrags is magical. Close your eyes and allow the musicality and vocal prowess of English to take you on a journey. A sensational recording! Prelude / Tomorrow is another beautiful composition that is perfectly suited to the acoustic style it is recorded in. Music doesn't get much better than this. Brand New Day is an excellent song and a perfect addition to the album. Share The End is a solid song to close the album with and while it compels me to listen to the album again and stay within English's back catalogue I find myself drawn to Carly Simon's original as I feel it is better than English's cover. Overall, Wine Dark Sea is an exceptional album with really only one song that feels out-of-place. As unlikely as it is, I'd love to see this album reissued on vinyl for a new audience to explore and appreciate; with the original cover art of course. Seriously, this Rainbow Records repressing cover art is horrible. Who thought this was a good idea? Wine Dark Sea is currently available to own on iTunes. Exceptional music isn’t just the domain of mainstream artists. Independent artists, such as 19-Twenty, are often just as talented, if not superior. Thanks to music streaming, finding these exceptional acts is easier than ever before. 19-Twenty is an Australian-based band with a sound that infuses soft rock, blues, roots, and folk music. I don’t know about you, dear reader, but I find this blending to be absolutely compelling and addictive to listen to. The Tavern is a beautiful song, with sensational vocals and overall musicality. It sets the tone of the album and shows just how talented 19-Twenty were at the commencement of their recording career. The Tavern also has an addictive rhythm and the mix, soundstage, and mastering will blow your mind. Exceptional! Kiama Town is simply stunning! Lorne picks up the pace in a literal fast-plucking manner. I love it! Louis Collins distorts and electrifies 19-Twenty's sound beautifully. It reminds me a little of early Rolling Stones and certainly Keith Richards' overall style on his latest solo release, Crosseyed Heart. 45 Degrees is an incredible song. This album just keeps getting better and better. Wasn't For The Beat, with its frantic guitar strumming isn’t generally an element of acoustic music that I enjoy. Nevertheless, the song grows on you the more you listen to it. Bucket Of Poison goes the grungy distortion route and interestingly reminds me of Adele’s Rumour Has It. That works for me. A solid 10/10! 1920'S Blues is a B-side and feels a little offbeat when compared to the rest of the album. 16 Hours has a simply stunning vocal presentation. Acoustic-based music doesn't get much better than this! Slow It Down has a fantastic beat and rhythm that ensures I’ll listen to the album again and stay within 19-Twenty's growing catalogue. As far as debut albums by Independent artists go, 19-Twenty is a pleasure to listen to from start to finish and the band has proven that a big recording contract, while likely desirable, does not dictate the quality of one's music. While I would love to own this album on vinyl, I don't believe it was ever pressed to the format. The edition on TIDAL Hi-Fi is sonically perfect, but I’ll be tracking down a copy of the CD as it is certainly worth adding to my permanent physical music library. 19-Twenty can be purchased on CD and iTunes. If you prefer streaming, 19-Twenty is also available on Spotify and Apple Music.